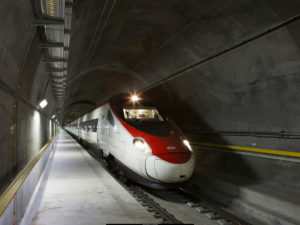 Bombardier’s TWINDEXX Swiss Express double decker trains have been granted their operating licence by the Swiss Federal Transport Office (BAV). On 14 November 2018 the Swiss Federal Transport Office issued the operating licence that will allow the Swiss Federal Railways, SBB, to run the new Bombardier TWINDEXX double-decker train on intercity and interregional routes. The licence for these multiple units was a necessary component to SBB introducing its new timetable on 9 December 2018 – in line with the annual European timetable change on that day. The operating licence issued by BAV is currently limited to two years. The Bombardier TWINDEXX Swiss Express is a double-decker multiple unit designed for long-distance routes. Each train has up to 1,300 seats with a lot of room for luggage. The trains are modern and comfortable and have power sockets throughout. In addition the TWINDEXX Swiss Express features modern passenger information systems and electronic seat reservation. SBB is able to run these trains in a number of different configurations. Some will include a restaurant car, some a family compartment. The TWINDEXX is also accessible throughout with easy boarding for all passengers, which means passengers with impaired mobility can comfortably use the service without assistance. Safety and security features include a fire alarm system and video surveillance. Bombardier says that the train’s improved energy efficiency means it is environmentally friendly even when travelling at 200 km/h.